YUM! 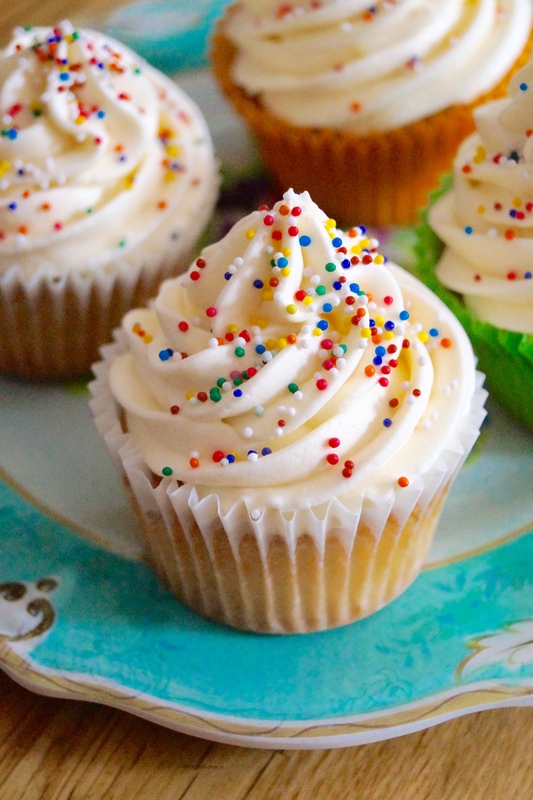 I just love classic vanilla cupcakes, but I’ve never made them at home. Now I have the perfect recipe for the perfect vanilla cupcake! These are gorgeous. And you went to Cyprus?? WOW! I can’t wait to hear more about that! Yes, Cyprus was amazing – blog post + pictures are on the blog today! Glad you’re looking forward to seeing them! I really like and usually eat Red Velvet Cupcakes but I’m going to give these a go! 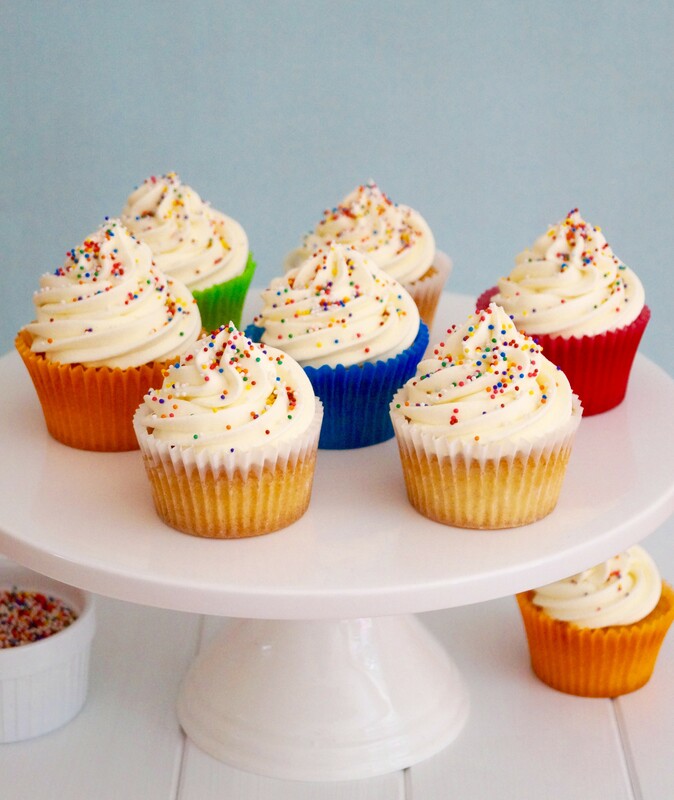 Vanilla cupcakes are my absolute favorite and these look perfect! 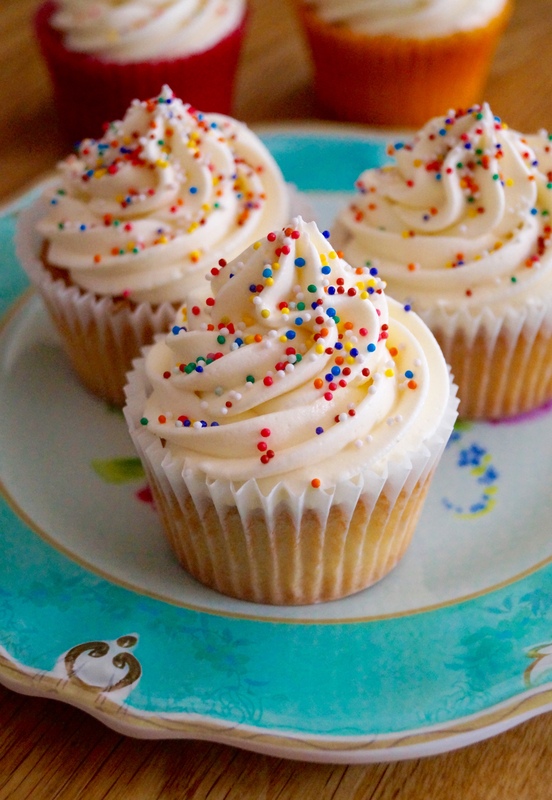 I Love Vanilla cupcakes.Your recipe is very helpful for make a cupcakes at home.I’ll try it. As always, these look fantastic! 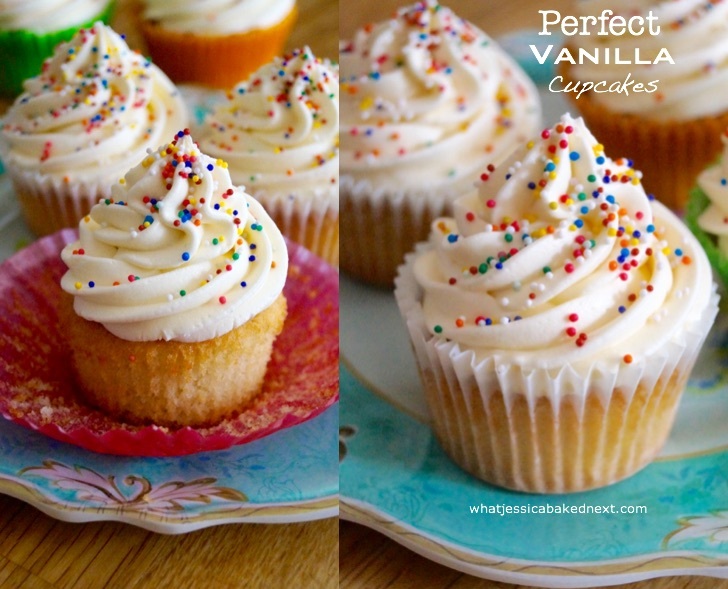 I’ve tried your perfect buttermilk vanilla cupcakes before and those were amazing. I was just wondering if there’s a difference between this recipe and that one? Hi Beverley! I’ve just changed the recipe and updated it slightly – because the cupcakes work well with or without the buttermilk, too. There really is no difference, where I say to add milk to the batter you can add the buttermilk in place of that. Hope that helps! Glad you like the cupcakes. Thanks for stopping by! Thanks for ur reply,i got the consistency right (made those strawberry frosted and maltesers ones i tagged u with on instagram) but i realized after they were done that i had used an equivalent of about 112 grams instead of 150 grams of butter, (with all my obsessive baking cant believe i made a mistake like that) but i was using cups so miscalculated! So that’s why my texture was off, not because of the milk/water. I’ve made these today but my mixture split when I add the first egg and even adding the flour didn’t bring it back together- is it supposed to do this? They still tasted yummy! Hi Jess this is urgent can I substitute caster sugar for normal granulated sugar. And what difference does the salted butter give? Hi Chi – sorry for the late reply. I have away on holiday this past weekend and not active on my blog. You can substitute the caster sugar for regular granulated sugar. Caster sugar is finer than granulated sugar and it dissolves better and mixes into ingredients easier. I generally use unsalted butter into cakes and cupcakes but salted butter is fine to use too. Hope you enjoyed the cupcakes! I’ve been looking for the perfect buttercream icing recipe as mine never looks anywhere near as good as yours so I’m going to give this one a good! Especially as I had never thought of using cream before. 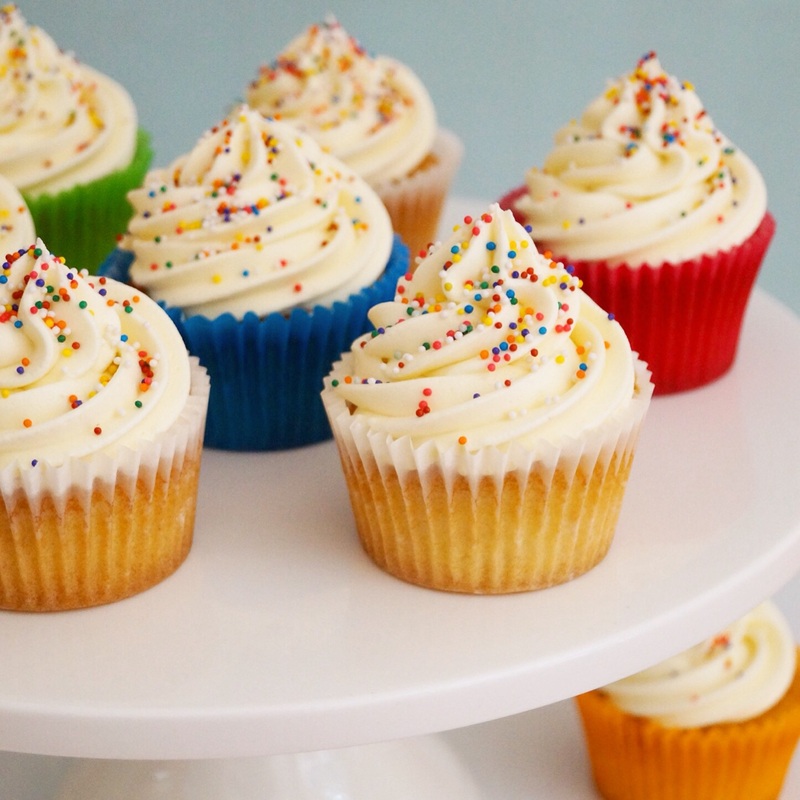 Would you be able to tell me the exact nozzle (brand, size etc) you used as these are the exact cupcakes I’m hoping to replicate! The cream makes the buttercream extra light and I find it adds a creamier texture than milk does. I generally use a large open star tip nozzle. I got mine from a pack in Lakeland, but you can easily order the exact one you want over the internet. I hope you enjoy the recipe, let me know how you get on. That’s great. Thank you so much for your help. I’ll be posting it on Instagram, so I’ll be sure to tag you in it! Am I able to print out this recipe???? Hi AJ – I have a print button located at the bottom of the post in the “share this” section. However, unfortunately it’s not set up to print just the recipe and method so you will need to select page 5-6 on your printer options to avoid printing all the blog post and wasting too much paper! Hope that helps. Enjoy the cupcakes!